Ventriloquist/Musician Dave Parker and his puppet friend Skippy are coming to present a program featuring humor and songs about bugs! Joining Skippy will be Claire DaLoon, Mozart the dog, and Bat Man, the talking baseball bat. There will be plenty of jokes and puns that keep the show lively and interesting for pre-school children through adults. Skippy’s favorites are the jokes about termites! There will be fun for kids of all ages as Dave pulls out his guitar to play and sing, “I Know An Old Lady Who Swallowed A Fly” as audience members hold up pictures of each animal being sung about. Dave and the puppets will also perform other classic bug songs including, “There Ain’t No Bugs On Me”, “The Ants Go Marching”, and Parker’s original, “Mosquito River”. 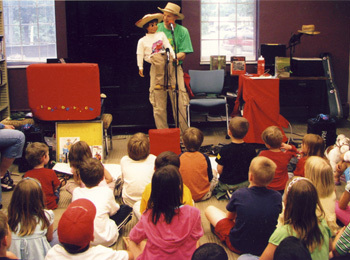 The purpose of “Skippy and Dave Go Buggy” is to teach children about insects while entertaining them with ventriloquism and involving them with music. Skippy and Dave have performed over 2000 shows in 24 states for over 20 years and look forward to making each one a joyful and meaningful experience for everyone in attendance.